Several of the Kingsbury Training Centre’s distinctive buildings remain. They have been refurbished and since 2004, have operated as the La Trobe University ‘Institute for Advanced Study’ seminar hall and meeting rooms, and accommodation for international students and academic centres. One of the first buildings on the Mont Park estate, the ‘Farm Workers’ Block’ is a solid, cream coloured, rendered two storey building. It originally had two large ornamental ponds and large trees out the front, constructed by the renowned landscape designer Hugh Linaker. It had staff quarters on the first floor, with offices, a billiard room and a large dining hall and recreation area on the ground floor. The four adjacent cottage wards were single storey and linked with covered walkways. They are also now used by the University. Further north, the ‘Idiot Block’, had a similar plan and the boys slept in the two large dormitories on the first floor. The north side has a long recessed veranda and an ‘airing court’. The ‘Laundry Workers Block’, built in 1913, had been designed for the laundry duties employment of 100 female patients. Up to 1918, during the Great War, it was requisitioned for use by the military. When returned for civilian use, it accommodated about 370 patients. Two red brick buildings still remain in this area in 2017, in the Wattle Ave and Main Drive, north of the main Mont Park precinct. They had been Wards D, E and F of Plenty Hospital and are now two storey apartment buildings, nestled between suburban houses. The unique phalanx of the 12 wards of the ‘Chronic Block’ still remain, one hundred years after their construction in 1916. The double storeyed red and white brick buildings have neat patterned windows and tiled recessed verandas facing on to imposing gardens. Wards A to F are currently being refurbished and used by La Trobe University and called La Trobe Terraces 1 to 6. Wards I to N (Terraces 9 to 14) are utilised by the University marketing, personnel and computing sections, the Victorian Environmental Protection Agency, and the Australian Institute of Archaeology. The tall round brick chimney linked to the original kitchens is still evident, towering over the middle of this space. The front section of this central area of the Chronic Block is now used by the La Trobe Italian Australian Institute. If you look carefully at the southside/back of this building, you will notice some of the original heritage cast-iron downpipe clips, with their decorative floral patterns. A short length of metal track still exists immediately behind the Terraces. This was used for both the hospital laundry trollies and the kitchen or food trollies. 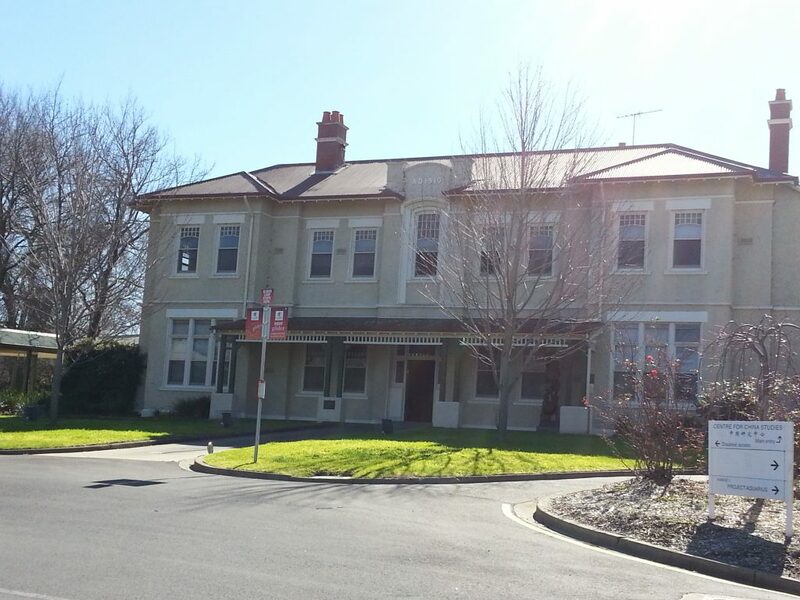 On Springthorpe Drive is BM La Trobe House, an impressive rendered cream building which housed the Mont Park ‘New Hospital Block’. It has an imposing two storey, central entrance section, then single storey wings. It serves as function rooms and accommodation facilities for the University. The Mont Park Mental Hospital ‘Paying Patients Block’ which had been opened in 1911, sits back from the intersection of Terrace Way and Springthorpe Drive, and is named University Lodge. From 1913, this was initially used for quiet female patients from the Yarra Bend asylum. It was later used for ‘paying patients’. At the Mont Park site entrance in Cherry Street, the 1923 Nurses Hostel and Matrons Flat (on the south end) are located with palms trees flanking the main entrance. Behind this impressive, two storey building with its rendered cream brickwork are a few smaller structures which La Trobe uses currently for administration, seminar and meeting areas. In 1930, a combined Church and Recreation Hall was opened at Mont Park and named the Ernest Jones Hall. This white Spanish Mission style building serves as a memorial to Dr W. Ernest Jones. 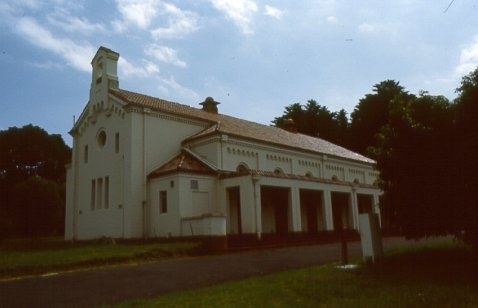 This Hall replaced the facility burnt down in February 1925 – an event reminiscent of the fire depicted by Louis Nowra in the play ‘Cosi’. This play was set at an asylum in the 1970s. Louis Nowra, who had studied at La Trobe University, worked as a ward hand at Mont Park in the 1970s. The Hall featured recently in the 2010 mini-series ‘The Pacific’. The outside, complete with reinstated bell, served as the Church for a wedding scene, and the interior was used as a crowded de-mobilisation administration building. It has been preserved in its original art deco style with cream and olive green walls and multiple entrance doors on the north wall. Immediately west and behind the Hall is a red brick building from 1943, which served as the site for male occupational therapy. sessions. The main Larundel hospital was built in the 1940s in a Tudor Revival style in red brick with typical half-timbered projecting gables. The architect, Percy Everett, chose to go away from the solid asylum style of the Mont Park buildings, and use a more progressive domestic character. 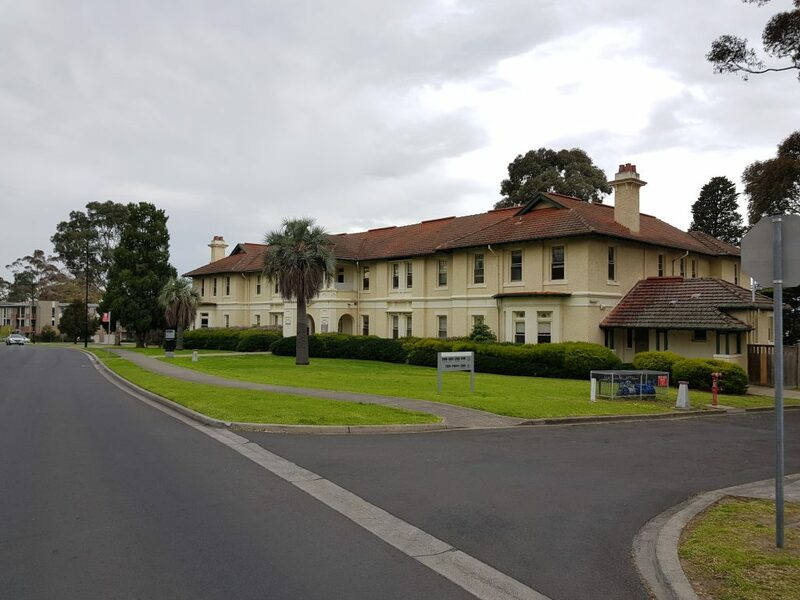 This part of the hospital precinct had boasted orchards and market gardens, and also had been used from 1943 – 1945 for the RAAF Women’s Auxiliary Air Force, and from 1946 – 1948 by the Victorian Housing Commission. So it has experienced many transformations. Most of the wards and houses of the Larundel site were badly vandalised and scrawled with graffiti after the hospital closed at the end of the 1990s. Some of the former Larundel wards, along Plenty Road, are being refurbished and turned into apartment buildings, maintaining the attractive brick work exteriors. None of the wards or residences of the Gresswell Hospital or the Macleod Repatriation Hospital remain. They were not designated as heritage buildings, as they were mainly two and three storey functional brick structures. They were located adjacent to Gresswell Hill and what is now the Gresswell Forest Reserve. 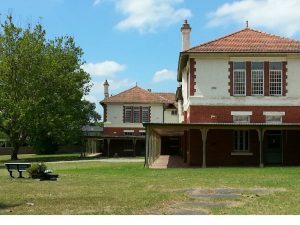 The one remaining section of the Bundoora Repatriation Hospital for military veterans is the beautiful Bundoora Homestead Art Centre in Bundoora Park on the west of Plenty Road. This original two storey mansion built in 1899, has an entrance hall, several ground floor living rooms with impressive fire places and a majestic decorated wooden staircase. The 8 bedrooms upstairs take in views of Melbourne and the surrounding ranges from wide ornate balconies. A stained glass ceiling provides light into the stairwell. This house had been Ward A for the older veterans. 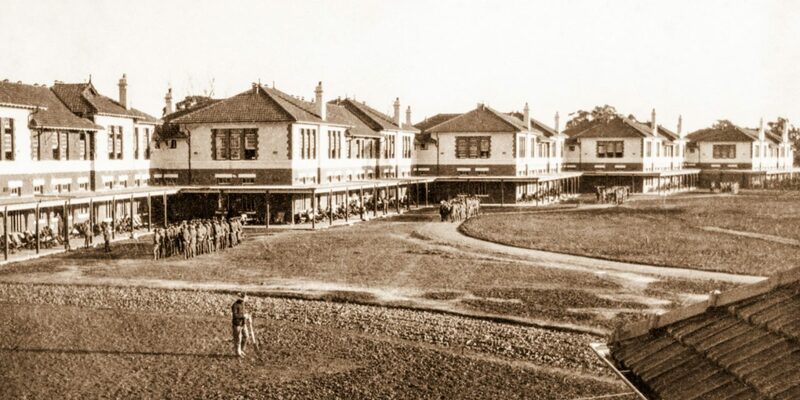 The Medical Officer’s House, Nurses Homes and other Wards were not far away. Residences, storage areas and garages were onsite for the engineers, gardeners, therapists, and the dozens of domestic and trades staff. 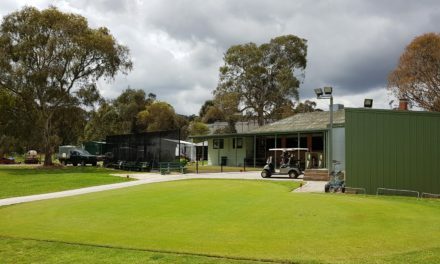 There were 51 buildings in the Bundoora Repatriation complex and surrounding convalescent farm, before it closed in 1993 and the final residents went into community homes. 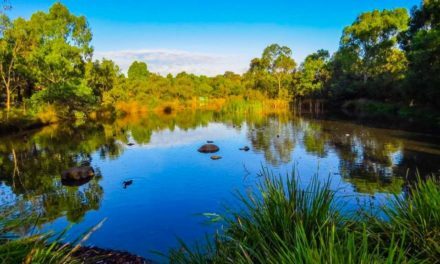 The 180 hectares of Bundoora Park remain available for community recreation activities with pleasant views to the city and the Macedon ranges, from Melbourne’s highest metropolitan point at Mount Cooper. 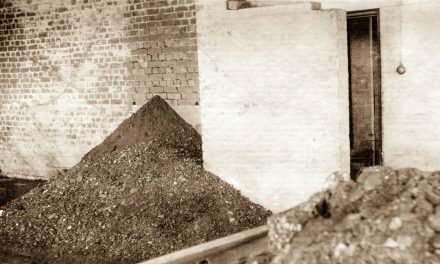 In the 1900s, Bundoora and Mont Park consisted of cleared acres of farmland with Mount Cooper and Gresswell Hill (then called Mount Sugarloaf) as its main features. 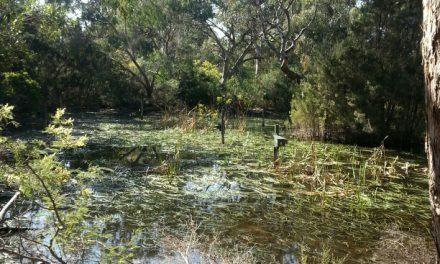 At times before World War One, military manoeuvres were conducted along Plenty Road, from Darebin Creek and Bundoora Park to the Plenty River Gorge, and they were often centred on Gresswell Hill. 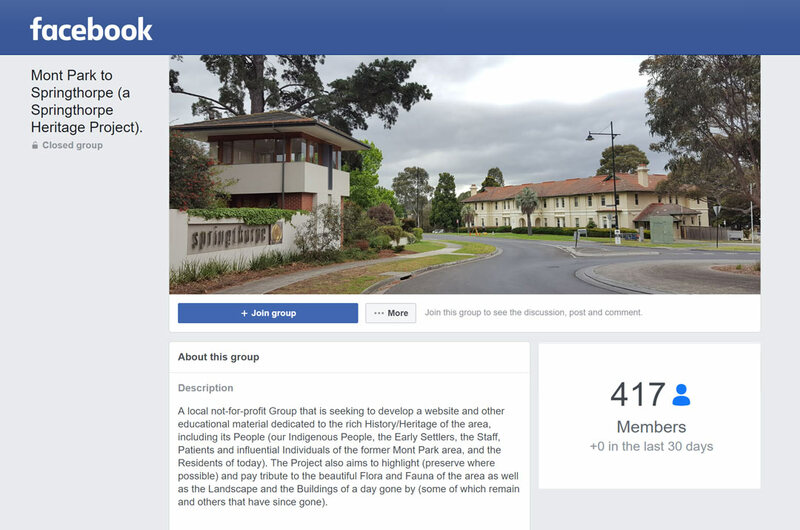 Hugh Linaker worked at Mont Park as well as other Victorian Mental health facilities and Parks and the MMBW Maroondah Dam area. His Mont Park worked spanned the period from 1912 to 1937. He designed and planted exquisite gardens of native and exotic shrubs and trees. He also planted an extensive and productive orchard near the Larundel buildings and developed a plant nursery to supply plants to other institutions and parks. 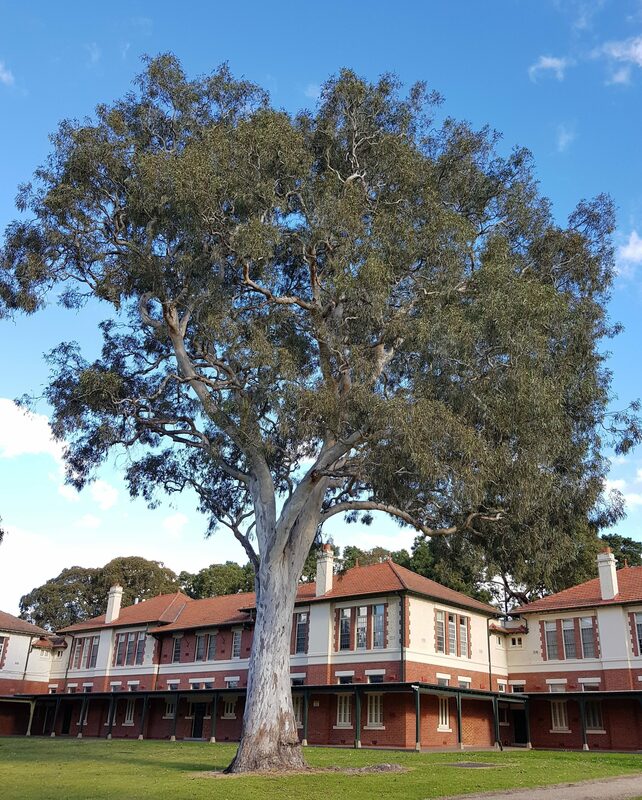 There are still many heritage listed trees remaining in the Mont Park and Kingsbury grounds. A distinctive and rare Pepper Tree Schinus lentiscifolia is located next to the airing yard of Terrace 14. It has small deep pink berries and bright green foliage. There are only three other, smaller examples of this plant in Victoria located in the Royal Botanic Gardens. Other significant and interesting trees include a Blue Atlas Cedar (Cedrus atlantica), a Golden Monterey Cypress (Cupressus macrocarpa) and several huge old River Red gums. Large deciduous elms change throughout the seasons, as do the magnificent English oaks (Quercus robur). As a contrast, the Algerian Oak (Quercus canariensis) is semi-evergreen. Its leaves have lobes that are shallower than typical oak leaves. 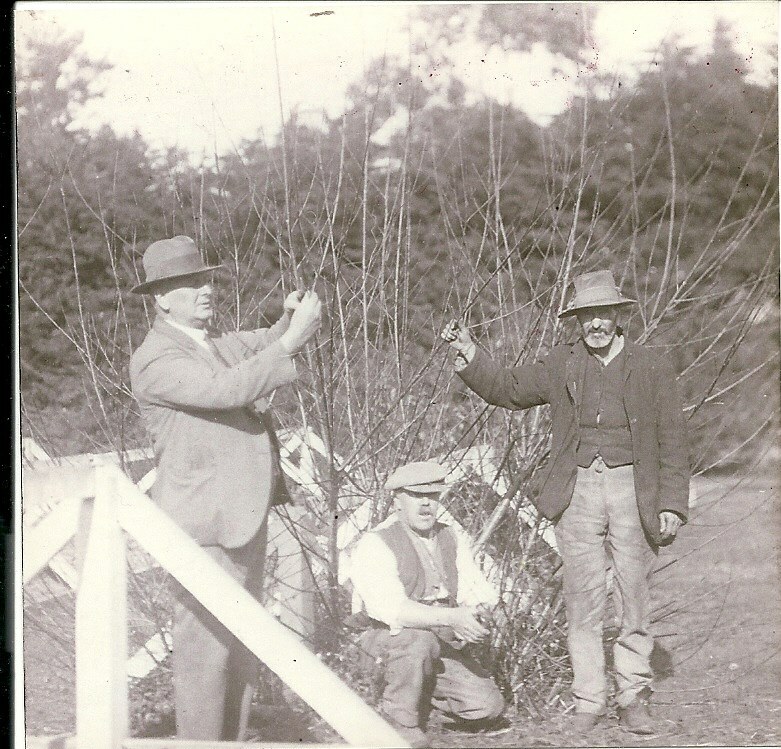 In 1919, Hugh Linaker was responsible for helping the WWI veterans propagate and plant the series of 46 sugar gum trees forming an ‘Avenue of Honour’ for their comrades. Almost 100 years later, these tall trees are still flourishing along the north side of Cherry Street. The area of La Trobe University near the Institute of Advanced Study, also has some beautiful significant trees, many of them palms or deciduous species, These add to the year round atmosphere and quality of the grounds. Hugh Linaker’s small brick cottage remains from 1911, and can still be seen off the west end of Main Drive just near the Plenty Road Polaris shopping centre.